Thank you to the Culinary Food Guide for allowing us to share this information. The use of herbs and spices date back prior to recorded history. Many early records reveal a mixture of medicinal and magical uses for herbs. But herbs were also used to mask unpleasant household odors and to enhance the taste of dull foods. The use of culinary herbs is a feature in one of the first recorded cookbooks from the first century epicure, Apicius. In England (1699), John Evelyn wrote Acetaria: A Discourse of Sallets which went into great detail of 73 salad herbs and their uses. 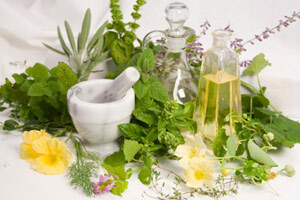 Today there has been a great surge of renewed awareness in herbs. A revival of the culinary arts and various ethnic cuisine has prompted new interest. Health conscious cooks have found that herbs contain no calories or fat – a fact of great importance to those on weight loss diets. Doctors even recommend the use of herbs and spices in salt-restricted diets to enhance flavor without adding sodium content. Adventurous cooks have found that raising their own herbs can be quite fulfilling as a hobby with the end results in cooking as just an added bonus. When using herbs and spices to season foods, it is important to use them sparingly. Herbs should be used to enhance the food’s natural flavors, rather than to dominate them. Only very heavily spiced, exotic dishes require a large amounts of flavoring in their preparation. Different parts of herbs are added to food recipes; leaves, flowers, and stems of plants. Each herb has its own distinctive taste, each with specific relationship to individual foods. They can enhance the foods natural flavor and create a livelier, tastier meal. The optimum time to harvest herbs is in the morning, after the dew has evaporated, prior to the sun warming their leaves. Handle the herbs gently without bruising or injuring the leaves and stems. The distinctive oils that give herbs their aromas and flavors are volatile and can be destroyed if injured. Select just enough herbs to be used, dried or frozen, the same day. Herbs should look healthy, fresh and clean, with out any type of discoloring. Since the flavor and aroma of herbs deteriorates quickly after picking, be prepared to use them immediately. If you must store them for a few hours, keep them in the refrigerator in a plastic bag that is perforated and can breath. When you are ready to use them, wash the herbs gently under cool, but not cold water and pat dry between paper towels. Freezing fresh herbs is an easy way to store them for longer periods of time. Clean the herbs delicately, blot them dry, and remove leaves from the stalks. You can freeze them whole or chopped, packing into freezer safe bags or airtight containers. Chopped herbs that are to be used in soups or stews can be spooned into an ice cube tray, covered with water, and frozen. When you are ready to use the herbs, just remove what you need from the tray and add to the pot. Most herbal flavors and aromas are released by heat. Although fresh herbs are usually preferred, dried versions can be used. When possible, grind whole spices in a grinder or use a stone mortar & pestle just prior to using for enhanced flavor. Toasting or dry roasting whole spices in a dry skillet over medium heat before grinding will bring out even more flavor. A good rule of thumb is to substitute 1 teaspoon of crumbled, or 1/4 teaspoon powdered, dried herbs for each tablespoon of fresh herbs called for. When using fresh herbs in cold dishes, they should be at room temperature. When preparing a dish that requires a lengthy cooking period, you can use a small, tied bunch of fresh herb sprigs. This bundle is generally known as a bouquet garni and customarily contains parsley, bay leaf, and thyme. Herbal combinations can also be minced and added to a meal immediately upon completion of cooking, and as a garnish before serving. This French practice is referred to as fines herbes. It contains chopped fresh chervil, parsley, tarragon, and chives. This blend is good on mild flavored cuisine like salads, scrambled eggs, and dishes containing poultry and fish. Try not to mix two very strong herbs together. Try mixing one strong and one or more with milder flavors to complement both the stronger herb and the food. Usually, the weaker the flavor of the food (like eggs), the less added herbs are required to get a nice balance of flavor. Dried herbs are more concentrated than fresh, and powdered herbs are more concentrated than crumbled. Each herb is slightly different but a starting formula is: 1/4 teaspoon powdered herbs is equaled to 3/4 to 1 teaspoon crumbled or the equivalent of 2 to 4 teaspoons fresh. If chopping fresh herbs, chop the leaves very fine because the more of the oils and flavor will be released. Start sparingly with the amount of an herb used until you become familiar with it. The aromatic oils can be less than appetizing if too much is used. Usually extended cooking times reduces the flavoring of herbs, so add fresh herbs to soups or stews about 45 minutes before completing the cooking time. For refrigerated foods such as dips, cheese, vegetables and dressings, fresh herbs should be added several hours or overnight before using. Note: Fresh Basil is an exception. If you add it to salad dressing overnight or longer, it becomes bitter. For salsa, hot sauces and picante, add finely chopped fresh or dried herbs directly to the mixture. Make herbal butters and cream cheeses by mixing 1 tablespoon of finely chopped fresh herbs to 1/2 cup margarine, butter, cottage cheese, low fat yogurt or cream cheese. Let it set for at least an hour to blend the flavor; then taste test on a plain cracker or a melba round. You will gain a great feel for the dimensions of what the flavor will be good with by taste testing in this manner. Flavor vinegar for use in cooking and in vinaigrettes. Bruise one cup of leaves for every 2 cups of white wine or delicate vinegar. Allow to steep for two weeks.